When I think about Boston, food is not usually the first thing that comes to mind, even though they call it Beantown, and Parker House rolls and Boston cream pie and clam chowder are all on my radar screen and are undeniably delicious. I think of Boston as a history town. The city where the American Revolution, and therefore America, really, was brewed into being. It is the birthplace of Franklin, a place so ripe with the ideals of freedom, it’s hard to see it for everything else it’s become in the last 200+ years. But all that may be changing, because I just ate my best meal of the year in Boston, and a New Yorker was responsible. 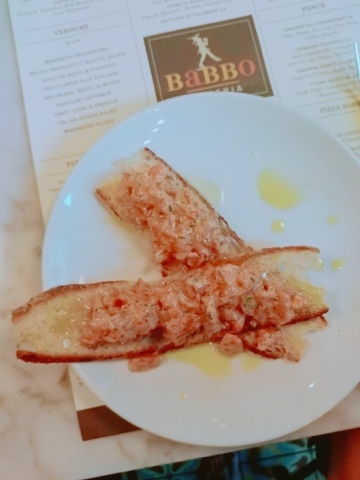 Until the very day I ate there, I had no idea Mario Batali has established an outpost of his famed Babbo Enoteca in Beantown. 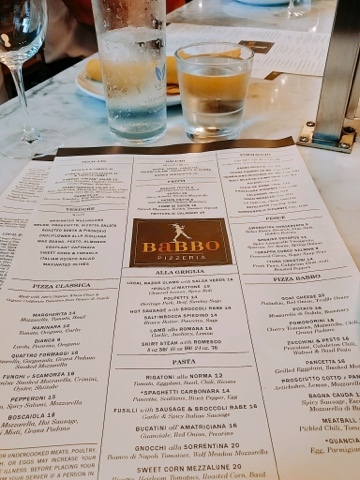 Babbo Pizzeria is in the Financial District of Boston, right downtown on Fan Pier. It’s not North End Italian, it’s not Union Oyster House (or Neptune Oyster, for you hipsters), and it’s not the Parker House Hotel, but you should make room for it on your Boston itinerary, because it is magnificent. Because our party of three (which grew to five once word spread) didn’t have a reservation, we were seated at the antipasti bar, and I didn’t mind one bit. In fact, being seated right in front of an enormous leg of prosciutto periodically being sliced for peoples’ appetizer plates suited me juuuuuust fine, thank you very much. This joint is huge, and can cater to large parties, but the intimacy of the marble-topped bar suited us very nicely. Let’s start with the most delicious appetizer just about ever – a play on a spicy tuna roll, Italian style. The tuna crostini was tiny, brunoised cubes of fresh tuna tossed in a very light but sharp mayonnaise spiced with Calabrian chili, plus roasted peppers. There was heat, but also roundness, with just enough acid, and the crunchy, airy bread and gorgeously green, peppery olive oil drizzled over the top made this stunning dish sing. We each should have ordered our own, really. This dish blew my taste buds out of the back of my head and they did a quick lap around the block before coming back to me. 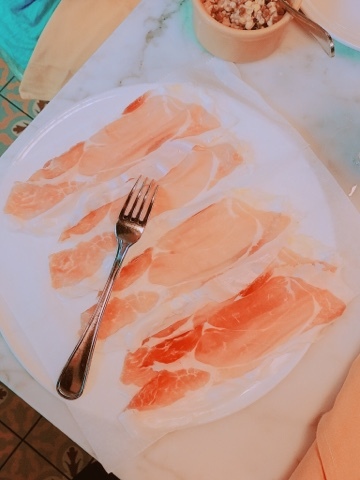 A perfect plate of sliced prosciutto provided the salt and fat any good starter course requires. This was some of the most meltingly tender prosciutto I’ve ever had, its flavor more refined than supermarket varieties – less salty, and more luxurious in its fat content. 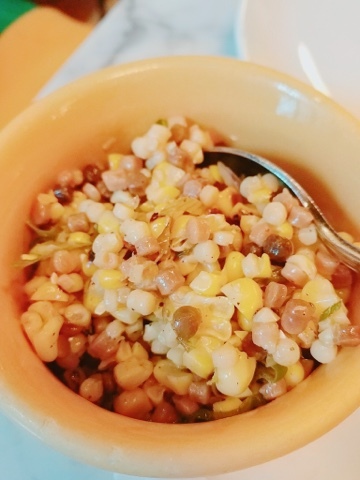 Sweet corn and fregola was a small dish of a cold corn salad made with a small, spherical Sardinian pasta that’s toasted before it’s cooked, for a, well, toasty quality that paired really beautifully with the sweetness of the summer corn and the sharpness of scallions. More excellent olive oil anchored the salad in fruity earthiness. 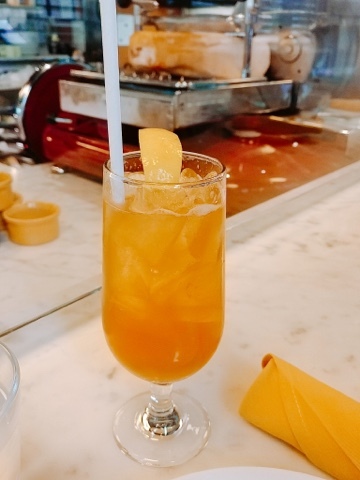 My cocktails, which were so boozy that I needed only two (but still drank three), were called Sardinian iced tea. You know how Long Island iced teas have no actual tea in them and are renowned for being 100% alcohol? Well, this combo of Prosecco, lime, and Amaro packed much of the same punch in an alluring, not sweet but incredibly complex glass. They were delicious. All three of our original party chose pastas for our mains, though pizza is the specialty here. I had this harebrained idea, once two more colleagues joined our group, that Carrie and I might split a pizza, but that was sheer madness. We never could have enjoyed dessert had we done it. 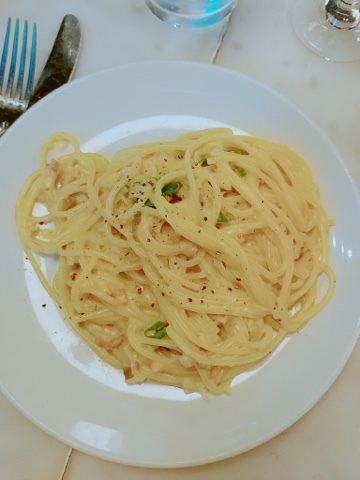 Spaghetti Carbonara from Babbo is a dish I have literally dreamed of for years. Over a decade ago, a writer for Gourmet Magazine (RIP, sweet friend) wrote a piece about his daughter’s love for this dish, and I saved it, in my family recipe binder, and have obsessed about eating it ever since. This night, my dream came true. At Babbo, carbonara does NOT mean alfredo sauce with bacon it in. It’s the real Roman deal here, pancetta with black pepper, pecorino Romano cheese and egg, with the small addition of scallion, which keeps this rich dish from being overly heavy. At home, I substitute green peas for the scallion, but this wasn’t a huge departure from what I do. The pasta was markedly al dente, with good chew, and the luxe richness of the egg yolk coated the small bits of cured pig with a decadent mouth feel and perfect savory bite. It’s a slam-dunk of a dish, and the best carbonara I’ve ever had in a restaurant. Also: NO CREAM. Thank God. As much as I loved my pasta, I think Carrie’s beat it. 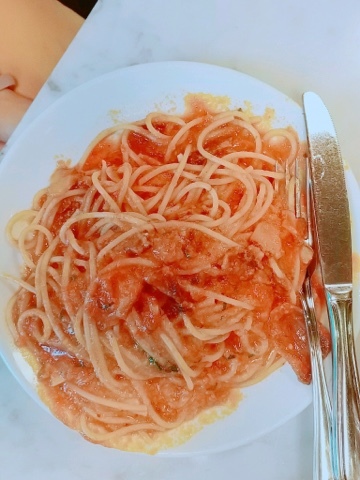 I hope that isn’t a blasphemous statement, given how long I’ve been wanting that plate of carbonara, but the bucatini all’Amatriciana was a complete work of art. Guanciale, which is cured pork cheek, is a more robust flavor than pancetta, and pared ith red onion, tomato, and piquant pecorino romano cheese, this was a powerfully flavorful dish of harmony. Holy God, get to Boston NOW and get this in your life. Not to be outdone, though, Carol’s rigatoni alla norma was no slouch. 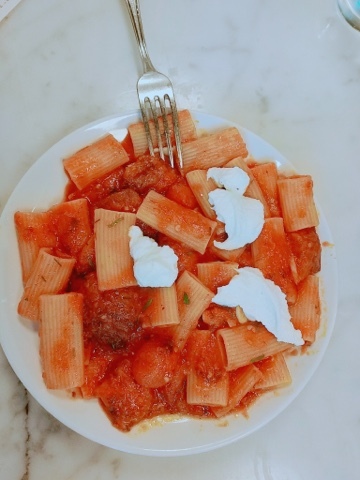 A loose tomato sauce with punchy basil, sweet roasted eggplant, the slight heat of those Calabrian chiles, and freshly made, pillowy and milky ricotta cheese coated the al dente rigatoni in lavish sweetness and savory depth. This was another masterpiece, frankly. Asked to choose between the three, I’m not positive I could. Babbo wasn’t finished impressing us, though, because dessert was coming. 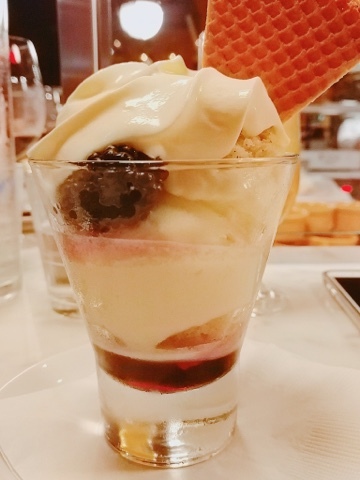 While Carol’s blueberry crostada was pretty de riguer, with vanilla gelato and crunchy granola topping, Carrie’s affogato sung with deep, rich espresso and strong notes of vanilla to counter the coffee. But my sweet corn coppetta was the winner of this round. Listen, making ice cream out of corn when it is at the peak of its summer sweetness is just good business. This had the flavor of perfect kettle corn, but cold and creamy, and was accented with tart blackberries and the crumbling, dry corn flavor of polenta cake to compliment the texture. None of us could stop dipping our spoons into this cup of summer flavor – it was extraordinary. Once our additional colleagues Nikki and Ali joined us, they copied our orders, so I never got to try the octopus in limoncello vinaigrette or fried squash blossoms, or pizza topped with sausage and escarole. 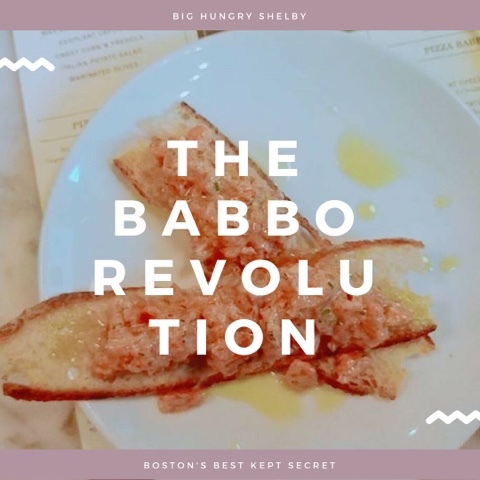 But I’ll be back to this spectacular eatery, which I unreservedly give a 10 out of 10 on the BHS scale, because while it may not be quintessentially Bostonian, Babbo IS the restaurant of my personal revolution. My hunger is big; my personality is bigger!